← Are Pregnancy and Fashion Mutually Exclusive? I am with you 100% ! I let my hair color grow out a couple of years ago and then about 6 months ago I started using henna on my hair. It is 100% plant-based and I love it. I wish I could say everything I use is natural but I have come a long way. I was fatigued often and needed to drastically change my diet. I let go of sugar, artificial sweeteners, caffeine and dairy(it is frightening what is in dairy products too!). So I am glad to know you are starting this much younger than I did. I feel better but I still occasionally eat and use things that I know are not good for me. It is difficult sometimes. However, I have come a long way. BTW.. I buy the henna product at Sprouts and it is very affordable. Alas the food is not as reasonable nor the cleaning products but I think it is well worth it in the long run. Glad you wrote this because I needed boosts sometimes. THank you! Christi! You never cease to surprise me w/ your awesomeness! 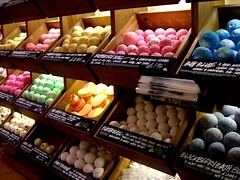 If I lived near LUSH I think I would spend a gillion dollars there. They are so great about giving samples-which I almost always fall in love with. I use Big shampoo (liquid) and absolutely love it, have you tried it? It’s for fine hair. Yeah, I can’t leave the Lush store without dropping AT LEAST $150+, even when I’m only going in for just one thing, lol. Those darn associates there, “oh, try this, you’ll love it,” which I do. 😛 People back home who I’ve converted to Lushies will give me their orders whenever I go to the store. I have tried Big, but it seemed to dry out my hair. 😦 I do kind of like the Veganese conditioner though! I can see how Big would dry out your hair, all that sea salt. I have oily hair so I like that. I’ve been wanting to try Veganese! I’ve been using Happy Happy Joy Joy. I like it but I don’t love it.